Even though last night's Person of Interest was a slightly goofy meta episode, with one character clearly intended to be a stand-in for fans of the show, it was also pretty intense. We now understand what the stakes are for the crime bosses of New York. Plus, Finch did something seriously out of character. So let's get one thing out of the way first, since this was a total fan service episode. Yes, people, there was a giant scene with Shaw, Finch and Bear. Bear was sad that Finch was in Hong Kong at an academic conference (part of his cover requires him to talk to "bitter academics" as he says). So Shaw can't get the dog to eat, and Finch has to speak in Dutch to Bear over the phone — at which point he noms the noms. OK, are you happy now? You got some Bear. Also, we got a number of the week who was kind of creepy and kind of adorable and whose entire purpose was to say things like, "Wow, you guys are superheroes!" 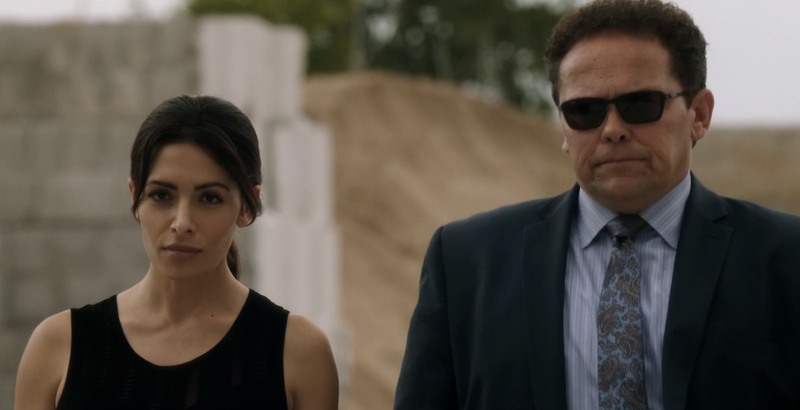 and "Wow Fusco you are so lucky that you get hang out with a guy who shoots people all the time!" I think this is the first time the show has nodded to its fan base like that. It felt briefly like I was watching Supernatural. This week's number, as I just said, was basically a Mary Sue for POI fans. He's pretending to be a detective so that he can solve a crime and impress some girl he likes at work, but then he gets in over his head. Turns out he's stumbled across some evidence that leads straight to a major shipment of ultra-high tech guns that are coming into the Brotherhood. These guns have exploding bullets, so they can cut through armored vehicles and shred bullet proof vests like paper. First of all, I love the idea that Dominic, leader of the Brotherhood, is such a high-tech badass. Winston Duke is also one of those actors who does a fantastic job conveying intelligence — so when Dominic finally has a showdown with Elias, we absolutely believe that Dominic is the kind of genius who almost pulled one over on mastermind Elias and the Machine Gang. But I'm getting ahead of myself here. When Elias finds out that these super-guns are about to be all over the streets of NYC, he wants to put a stop to it. Not just to beef up his armory, but because he doesn't want to see the kind of destruction these guns would unleash. Whatever gang gets them has the ordinance equivalent of an AI — a weapon that tips the balance of power so far out of whack that chaos is sure to result. So as we're watching Elias and Dominic struggle to control these guns, we always have in the back of our minds the struggle to control the Machine and Samaritan. We also realize that Elias is basically working with the police at this point. He hands over the super-guns (except one he keeps for fun) to the NYPD. Which is what makes his showdown with Dominic so interesting at the end of the episode. The two crime bosses have basically declared war on each other, and we know they'll be using brains as well as brawn to fight this one out. Elias has basically declared himself an ally of the cops, too. So who is the Brotherhood allied with? Could it be ... Samaritan? Returning for a moment to fan service, let's talk about Finch's adventure as a spy/seducer. While he's in Hong Kong, he meets an entrepreneur/AI developer named Beth Bridges, who starts a conversation with him by arguing about whether we should place ethical restraints on AI behavior. We already know Finch's opinion on this, and Bridges takes a Root-like approach, arguing that we should allow AI to develop on their own without hobbling. The two are going into full flirt mode, and Finch is acting waaaaaay out of character. When their bags are stolen by a mugger, he even sleuths out where the mugger works and grabs their bags back from him. What? Finch is being romantic lead guy? Um, nope. As much as Bridges totally deserves to have a cute nerd hitting on her, it turns out the whole thing was a setup. Finch knows that Bridges is working on an algorithm that's of potential interest to Samaritan (we find out at the end of the episode that he's right about that), and he wants their "mugger" to install some kind of keylogger on Bridges' computer so he can track her. And boy was Finch right to track Bridges. It turns out that the angel investor she's courting to pump money into her AI algorithm company is none other than Greer (who is really just a front for Samaritan at this point). So not only is Samaritan gearing up to run the government — it's also trying to augment its own powers with new software. Which makes perfect sense. Also, as an aside, I love that this show is so concerned about technology that Finch gives us a quick infodump on how he's able to communicate with Shaw without using the mesh network phones. Turns out that as long as they don't use certain "key words" their conversations won't be flagged on the open network. So mostly they'll be communicating with the mesh net phones, but sometimes they can talk over regular satellite networks as long as they avoid certain words. Last week, I was thinking a lot about how this show is about the United States falling prey to a techno-fascist regime, centrally controlled by an evil AI. But this week's story has me thinking that the show is about something a lot more terrifying: a failed state. Just think about our major power brokers at this point. We've got crime bosses Elias and Dominic, as well as surveillance profiteer Greer. The NYPD is in a shambles — even a fake detective is able to do a better job than they can. And the US government? Well, it's become the puppet of a malevolent AI and doesn't even realize it. So if these non-government actors are becoming major power brokers, we're not really talking about fascism. We're looking at a United States where government has crumbled completely. State powers are being manipulated by private interests to the point where government is just plain collapsing. And the creepiest part is that nobody has noticed.